I have tried many new products over the years, particularly when I thought that it would help me bag another turkey. With that being said, I had never hunted with a decoy, until a few years ago when Alabama finally legalized the use of them during the spring season. Now, I very seldom, if ever, go into the woods without an Avian X decoy bag over my shoulder. I had also never hunted turkeys out of a pop up blind, until recently. I will admit, I have hunted deer and filmed fall turkey flocks using a pop up blind before, and I had often contemplated trying to bow hunt spring gobblers with one, but have not done so to date. My thoughts on the use of a pop up blind all changed this year during Alabama’s 2013 youth turkey season. A good friend of mine called me a few weeks before Alabama’s youth turkey season, and said that his five year old son wanted to go turkey hunting this year. With my son way too young to accompany me on a hunt, I jumped at the chance to get in the turkey woods a week before our regular season was scheduled to begin. As we started out that morning, it was cool to see a young child breaking daylight on his first turkey hunt. The birds chirped, owls hooted, and eventually turkeys gobbled, which really caught the youngster’s attention. After a couple of turkeys had made their presence known, we decided that we would try to set up on the closer of the two. This is when it got interesting! As we moved in to set up on the bird, I had to remind myself to slow down and let the little one catch up. Our first setup rendered a few gobbles, but he was not interested enough to cut the distance between us. We picked up again and moved closer for our next setup. This time we got a response and he started our way. No sooner than the gobbler started our way, we heard a hen yelping behind us that quickly went straight to the gobbler. That was the end of that game. Our next move was to go after the other bird that had gobbled at daylight. To speed up the process and to keep the kid from walking very far, all to try to make the hunt enjoyable and successful, we cut the distance using an electric cart. This is the ticket to moving in on turkeys when terrain and property access roads allow! We were able to ease the cart within a couple hundred yards of where we planned to try to strike the gobbler from earlier that morning. One thing that I had failed to mention was all of the time and preparation that my buddy had done scouting prior to the opening of the youth season. He had been listening for turkeys, walking the property looking for sign, and had out multiple game cameras. It just so happens that on one game camera, not far from where the gobbler that we were headed to had been roosted, my buddy had been getting gobbler photos at all times of the day. He had already set up a ground blind on this field, just in case we did not hear any gobbles at daylight. As good fortune would have it, one of the gobblers that we had heard was definitely within hearing distance of this food plot. My hunting companion and his young son got situated into the pop up blind watching this field while I set up the new Avian-X Strutter decoy, along with an Avian-X LCD Breeder hen, about 20 yards from their blind. I nestled my way into some nearby brush and set up the video camera, all in the anticipation that the gobbler had not gone too far and that we would get a response. The first few series of turkey calls produced nothing, but then a crow flew overhead noisily cawing, and the gobbler quickly let his position be known. He was not more than 200 yards from the field. At this point, I couldn’t stand it and let out some excited cuts and yelps on my Zink Thunder Ridge Aluminum call and got an immediate response. This seemed promising until 15 minutes went by and he let out another gobble from across the field, sounding like he was heading away. A little clucking and purring and soft yelping yielded a few more responses and the bird started coming. As he approached the field, I could hear him spitting and drumming, but could not see him for what seemed like an eternity. After what was actually about ten minutes of this, a fan appeared and as soon as the gobbler saw the decoys, the show was on! 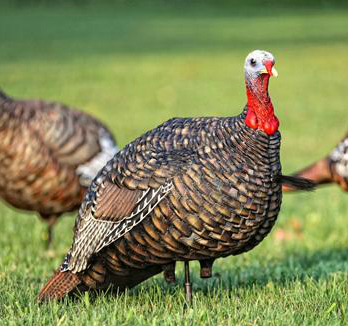 The gobbler marched straight toward the strutter decoy, beard swinging, until he got about 15 yards away. The bird then went into strut, and slowly made his way right past the hen decoy to the strutter. After a few rounds around the imposter the wing flapping and fighting purrs began. All of the commotion and distraction between the gobbler and the decoy allowed the young kid in the blind plenty of time to position his gun onto the gobbler’s head. As soon as the tom took a breather from beating up on the decoy, that five year old put a load of HeviShot into his head! This was a great and very enjoyable hunt both for me and the father and son that I was able to share this experience with. I honestly feel that with all of the modern technology available today, we are able to take advantage of these new products that can allow us to get our kids introduced to the sport at a much earlier age. From riding on the electric cart to the turkey, to getting positioned into a pop up blind where a child does not have to remain perfectly still, to setting up lifelike decoys that provide distraction from the hunter while drawing a gobbler within gun range, it has become apparent to me that although I may not use a blind often or be able to use an electric cart on every hunt, there is definitely a place for them in our sport. Whether it is taking a kid, disabled, or elderly hunter on a hunt that would have been much more difficult, if not impossible, I definitely think that the combination of game cameras for scouting, along with a pop up blind and lifelike decoys for the set up can definitely provide a way for you to get more people involved in the sport while increasing their odds of having an enjoyable and successful hunt. Harvesting an animal is not the only measure of a successful hunt. If we can make the hunt as easy as possible on these young or elderly hunters, it will make the hunts enjoyable and make them want to keep going. That is a success in itself!